For those who simply can’t get enough, the new 530 EXC is heading to the start line this year with a completely overhauled chassis. An insatiable fighting machine that is unfazed by even the toughest Enduro challenges on the one hand, and a complete workhorse that undeviatingly pursues its course – strong and reliably, on the other. Fed by the powerful SOHC engine, it provides brute four-stroke power but can also impress its with soft power when needed. Ergonomic tank for ideal contact with the bike. Special KTM airflow system with ducts beneath the spoilers for an optimum fresh air supply to the airbox. Another advantage for racing: transparent polyethylene lets you see the fuel level from the outside. The seat of the Six-Days bike is supplied with additional pockets and logos. It also has a reduced-weight, optimised foam core for improved comfort and longer service life. KTM’s Mattighofen factory in Austria has invested a huge amount of effort in developing the latest Offroad motorcycles for the 2010 season with the clear aim of improving the advantage on loose ground even more. Star of the KTM model range is the revolutionary MX1 innovation, the 350 SX-F. The current motorsport season is well underway and the KTM factory riders have already claimed a slew of podiums on the latest “Made in Austria“ Offroaders. Now the sports brand from Austria presents the line-up of brand new motorcycles for the Model Year 2011. With three high quality and competitive Minicycle variants for the youngest offroad enthusiasts, a total of six uncompromising Motocross motorcycles especially designed for winning races as well as eight versions of Sport Enduros, the Austrian manufacturer presents the perfect line-up for the coming season. 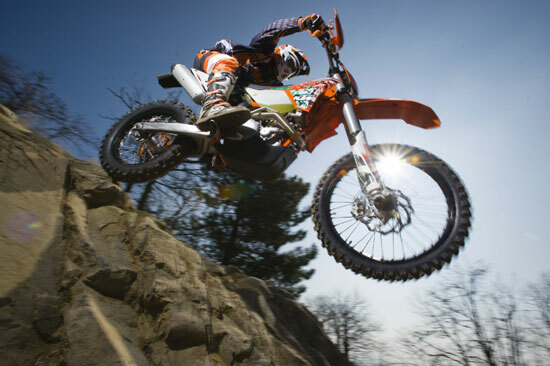 In doing so, KTM once again underlines its leading role in the world of Offroad sports activity. The huge amount of depth of development in the new Offroad model range extends all the way from the 50 cc two-stroke (50 SX) right up to the powerful displacement of the Enduro 530 EXC Sixdays-R. In between there is a whole range of tailor-made sports machines for every type of offroad riding and for every rider profile, all absolutely true to the KTM “Ready to Race” philosophy. KTM has just the right machine, regardless of whether it’s for the ambitious hobby rider or the ruling world champion. As well as the huge development effort that the KTM technicians have applied to the entire model range, these new motorcycles still include some very special innovations. This especially applies to the 350 SX-F, which was first exhibited last autumn. This, the first ever 350 cc bike deployed in the MX1 World Championship, has already been mastered by factory riders Antonio “Tony” Cairoli and his Red Bull KTM teammate Rui Goncalves. Cairoli not only won the premiere race for the 350 machine; after his GP victories, he is also leading the championship standings. In addition to the unique engine concept, the MX lineup for the 2011 also includes a newly developed frame and chassis components. The Enduro models, which have been similarly decorated with world championship titles all also profit from the massive amount of experience gathered by not less than 176 World Championship titles. This can be seen both in the feather light two-stroke versions as well as the highly modern and performance powerful four-stroke models. With significant improvements in a while range of areas as well as the extensive series equipment, these machines are prepared in the best possible way for the new racing season. 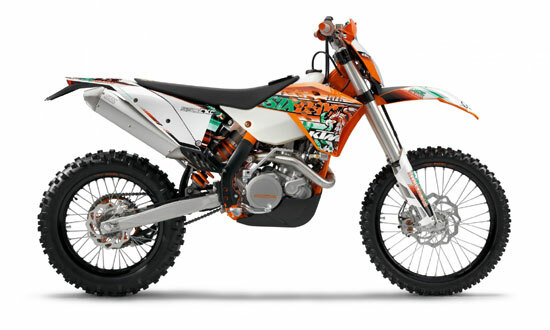 The new Motocross, Enduro and Minicycle models will be delivered to KTM dealers from June of this year.